You might think natural lighting only offers advantages in the home, and although it provides plenty of them, poor planning leads to a few disadvantages. Lighting affects the home's colors. It may play a part in your overall comfort and even health. Weigh the pros and cons to make the most of every sun-filled nook and naturally lit cranny. Natural lighting streaming into living room with golden walls. If you've ever questioned why paint swatches look different at home than they do on the store's display shelf, lighting is the answer. 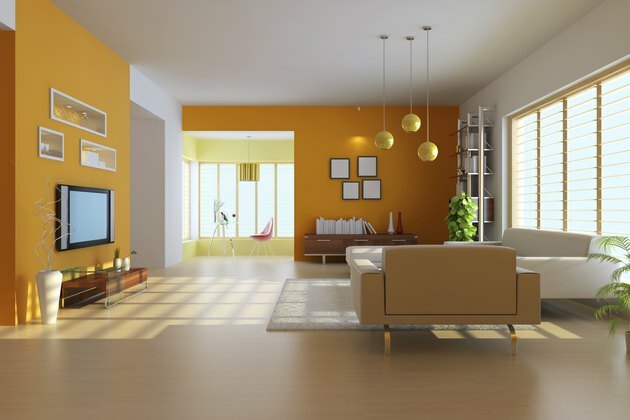 Natural light makes everything -- flooring, furniture, houseplants, wallpaper and paint -- look its truest color depending on window direction and time of day. Midday sun is more neutral than morning and evening sunlight, which resemble warm candlelight, according to Stanford University. For good color results, opt for bold colors in north-facing rooms and warm reds or yellows in easterly rooms. Early light through west-facing windows casts shadows and washes out color, so go with pure white or saturated, non-reflective flat color for better results. Southern windows and skylights enrich all colors. Although it's warming and cheery, the sun's ultraviolet rays can fade color. When you're not using rooms that fill with sun at certain points of the day, close the curtains or blinds to avoid color-robbed rugs, art and upholstery. Along with natural light comes increased temperature. You likely won't complain about this in the cooler months but when the days grow long and the mercury threatens to bust out of its glass tube, you may second guess the sun's value. Opt for windows with a low-emissivity film that reflects much of the sun's infrared light from outside yet helps retain some of the home's heat when the mercury drops. Light- and heat-blocking drapes do the same but at the expense of natural light. When planning a home's design or remodel, face south the busiest rooms such as the kitchen for maximum natural light. Install kitchen and bathroom exhaust fans that vent outdoors to get rid of much of the heat windows and the stove produce, and the excess humidity that makes warm air feel warmer. Oscillating fans decrease the need for air conditioning and closed curtains. In the same way natural light makes your home's interior colors look different, it makes skin appear natural, more radiant and less shadowed than with artificial lighting. Natural light may improve mood, and it decreases eyestrain and headaches, explains the National Renewable Energy Laboratory. As for feng shui, a home filled with natural light welcomes wealth, puts zip in your morning step and opens your mind to welcome new opportunities, says feng shui consultant Ken Lauher. Why Do People Put Tin Foil on Their Windows?